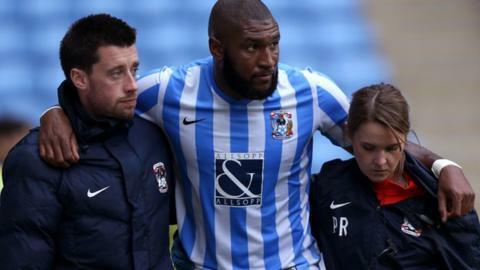 Promotion-chasing Coventry City have lost their central defender Reda Johnson for the rest of the season with a hamstring tendon injury. Johnson, 26, who missed more than half of City's games last season with a string of injuries, sustained his latest one in Saturday's 0-0 League One home draw with Blackpool. Following a scan, the club then sought advice from several specialists. And it has now been decided that he will not play again this season. A club statement said he will be "monitored by the club's physiotherapy department to help him make a full recovery". Coventry City are on a run of five games in which they have not conceded a goal - other than four penalties in the shootout in their JP Trophy exit after a 0-0 draw at Yeovil. Keeper Reice Charles-Cook is just a game and a half away from beating Steve Ogrizovic's club record. After beginning his career as a trainee with French side Amiens, Johnson arrived in English football with Plymouth Argyle in 2009 before moving two years later to Sheffield Wednesday. Johnson was immediately made captain by Steven Pressley after signing for the Sky Blues from Wednesday in July 2014. He lost the captaincy in an injury-hit campaign in which he played just 22 games and produced an impressive haul of six goals from set-pieces, but Mowbray persuaded him to sign a new one-year contract in the summer.